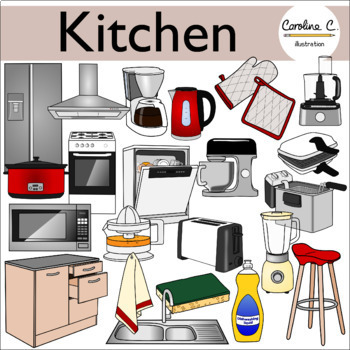 This set contains 48 illustrations of items and appliances found in the kitchen. 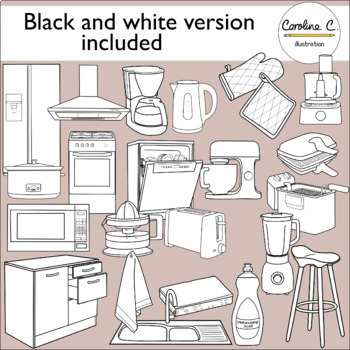 There are 24 color and 24 black and white images. 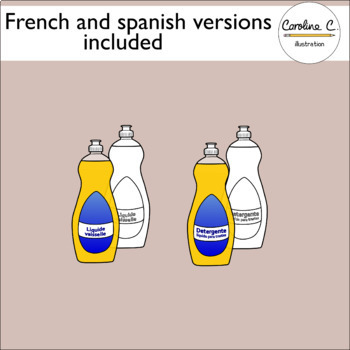 French and Spanish versions of dishwashing liquid are included. All graphics come in color and black and white, they are .png files and have been saved at 300 dpi. • Personal Use: You may use my clip art for your personal creations or for your own classroom. • Commercial Use: You may use my clip art for commercial purposes but you must make sure that all images are flattened and secured. You may not use my graphics to create other clip art or sell it as your own. You must provide credit in the form of a link to my TPT store or using the image provided in the download. Click here to follow my store and get first access to new products and store discounts.